← OPEN THREAD: What did you think of JDM Legends episode 01? Though owned by Toyota, the Megaweb showcase in Odaiba, Tokyo and the adjacent History Garage offer much more than Aichi steel. Since last year, there has been a rotating exhibit of famous rally cars, often on loan from other automakers. Currently, it is Mitsubishi’s turn, and Tokyoites can see three of its legendary dirt throwers in person. The earliest of the three is the 1976 Lancer 1600GSR. Long before the Evo, the first-gen Lancer debuted as a tough compact sedan in 1973. That same year, Mitsubishi sent it off to battle in international rallying, entering several examples in the 8th Southern Cross Rally in Australia. Amazingly, the Lancer swept first through fourth. The Lancer 1600GSR’s most famous win, however, came in 1974 at the East African Safari Rally, a punishing race over 3,700 miles of untamed wilderness over five days. Somehow, Mitsubishi managed to take first place, besting Porsche, Lancia, Peugeot, and Nissan. The Lancer continued to rack up wins for Mitsubishi until 1979, when the company temporarily suspended all motorsports activities in the wake of the second oil crisis that decade. It wasn’t until 1981 that Mitsubishi would restart its racing program, returning to WRC with the Lancer EX2000 Turbo. Its 4G63 engine is said to have produced 280 horsepower, an amazing output for a 2.0-liter back then. 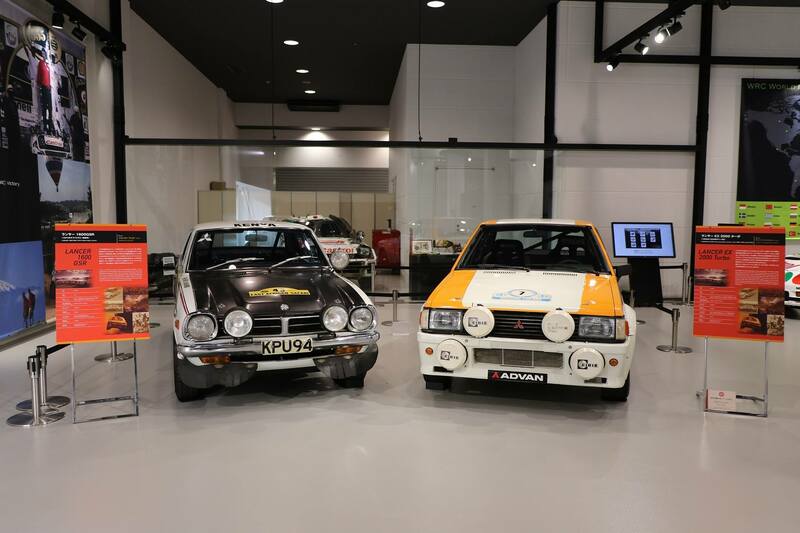 The car on display was entered in the 1982 1000 Lakes Rally in Finland, where it finished third. Unfortunately, during Mitsubishi’s hiatus, Audi was hard at work developing the 4WD Quattro, and the RWD Lancer was bested by the new technology. Mitsubishi ceased WRC competition again and went to work developing its own AWD system. That work manifested itself in the Starion Group B car, but unfortunately Group B was canceled before the car could compete. Mitsubishi continued developing its AWD formula, though, and in 1987 launched the Group A Galant VR-4. The Galant battled bravely, but its greatest success was limited to two consecutive victories as the Cote d’Ivoire Rally in 1991 and 1992. In 1993 Mitsubishi debuted the Lancer Evolution, which would set the foundation for all the company’s future rally machines. As we wrote in our 25 Year Club retrospective of the Lancer Evolution, “the Evo III’s racing debut came at the Safari Rally, where Shinozuka ran a hard fought race and came in a close second to Yoshio Fujimoto, the former Mitsubishi driver who had switched over to Toyota’s GT-Four Celica. 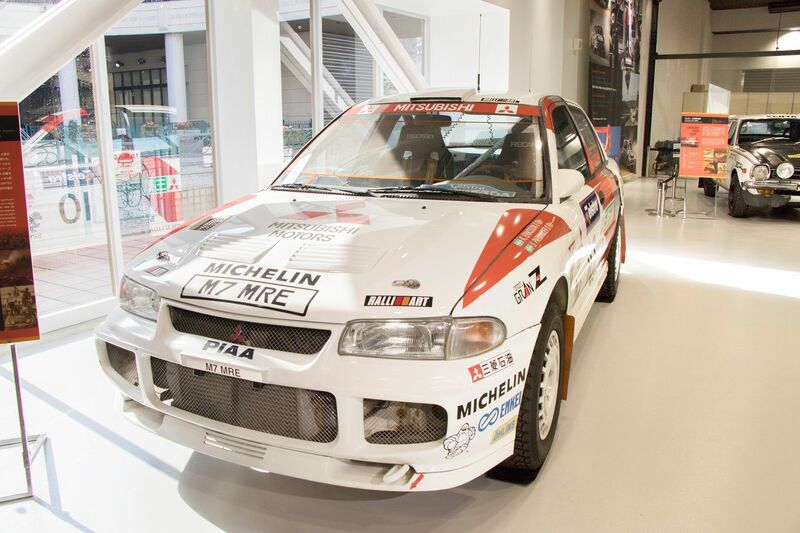 Eriksson claimed victory in both Australia and on the Hong-Kong-to-Beijing Rally, while Mäkinen took the Rally of Thailand.” The last car displayed is the 1995 Lancer Evolution III, the greatest of the first-gen Evos. The display of Mitsubishi rally machines is currently ongoing and will end May 20, 2018. If you are in Tokyo between now and then, the display is well worth a visit. tagged: lancer, Lancer Evolution III, Megaweb, mitsubishi, rally, safari rally, wrc. No mention of the Galant VR4? Henry, I had the exact same thought. Why no love for the EVO-zero? These cars were on loan from Mitsubishi and I don’t think three company has a VR-4 rally car in their collection, unfortunately. I have photos from the Mitsubishi museum, taken long before JNC was a thing. I have refrained from posting them because of the laughably low-res picture quality from a gen-one digital camera, but I could whip up an article if you guys want to see it. Please do!!! Great stories as you guys tell them will make up for pictures that may be better than you think! Pre JNC car pictures from 1999 that would be cool Ben. The Galant VR-4 story was a lot more successful than you mention here, but there is also some debate whether Mitusbish was “playing fair” with the early non-evolution years in the WRC. The VR-4 won the ’89 1000 Lakes, ’89 Lombard RAC, ’91 Swedish, as well as the ’90, ’91, and ’92 Cote d’ivoire Rallies. Competitors noticed these relatively large cars were posting very fast stage times early on, but it was the ’89 RAC where people were questioning how the Galant was able to post such dramatically shorter stage times. After that win, Mitsubishi actually had all works-cars sent back to Japan, and actually DENIED the works team to compete the first serveral rounds of 1990. When the cars returned, they did not achieve those consistantly fast stage times any further. Also of note, the reason why Mitsubishi seems not to have any works VR-4 in their fleet was that until the mid 1990’s, the remaining cars were used as crew shuttle/stage preview cars, and were literally driven into the ground.